The weaknesses of the Articles of Confederation with regards to the lack of power given to the central government would eventually cause enough problems to doom the document, but this was decided on quickly. Many specific issues would arise that led people to question the need to change the document in the years after its adoption. The most important of these (at least early on) were the issues revolving around the weakness of the economy. Soon after the Revolution, the US was hit with a depression that would be difficult to deal with when the country had no unifying leadership. While the causes of recessions and depressions are often debated among historians, it was clear that this depression was, at least in part, cause by both the inability for the US to pay its war debt and the lack of trade that was occurring between the states (largely because of currency issues). To keep themselves afloat during this time period, many creditors would ask debtors to speed up the repayment of loans because they were worried about further deflation of the currency. Farmers were also put in a harder situation when they were asked to not pay their loans with goods (like their products from the farm), which was what they had done in years previous. For a country that had just fought a revolution based on economic problems, these issues would soon become the topic of anger for many people. The states were too strapped to help the struggling people and the federal government had no power to unify people to fix the issue, so they continued down a spiral. Farmers were the group that was the hardest hit in the country, and specifically farmers in Massachusetts. These Massachusetts farmers started to hold meetings about the new “tyrannical government” and start to consider passive resistance movements to try to get change. At the same time the merchants blamed the weakness on the lack of trade agreements with other nations due to the weak national government. Foreign creditors were unwilling to help people in the US with their debt issues because they doubted that we could pull out of this when we had such a weak government. The anger among farmers in Massachusetts would finally result in a relatively small, but important, rebellion led by a hero of the Revolution named Daniel Shays. Shays would lead 2,000 farmers in a rebellion that would try to close down towns in an effort to stop foreclosures on poor farmers in Massachusetts (1786). He and his group would eventually try to seize the federal military arsenal in Springfield (1787) in order to get the weapons to widen this fight. 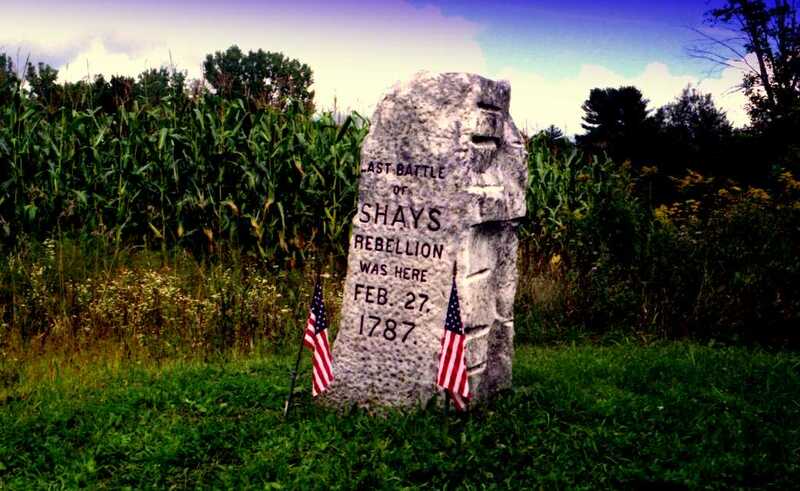 Shays Rebellion would be ended when the militia was called in from Boston to deal with the small group of farmers. Shays and his men were beaten quickly and sentenced to death for their rebellion soon afterwards, although they would be pardoned later. While this rebellion was never a serious threat to the government it did show the people that change was needed to prevent mob rule from spreading. Lawmakers would soon start to seriously question the need for major changes to the constitution due to the issues at the time. When a group of delegates from five states attended the Annapolis Convention (1786) to try to fix the issue of interstate commerce, they quickly shifted the topic to making changes to the Articles of Confederation. The group would eventually propose a new convention to consider adding amendments to the Articles of Confederation, and Alexander Hamilton would set the date for the convention for the next year.